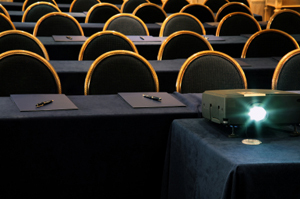 We can relate with the kind of stress that comes with coordinating a meeting or convention. Folders, flyers, table tents, notebooks, comment cards, transparencies, name tags -- the list seems endless. Our highly trained convention staff will work ahead of time to produce materials and deliver them to your hotel when you arrive.